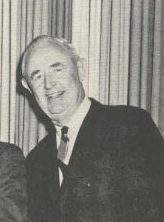 Coach Ernst Hartmann began his coaching career at Compton Senior High School in 1931. In Coach Hartmann’s 34 years of coaching track, his team’s lost only three dual meets. Coach Hartmann’s 25 year cross country record was an astonishing 174 wins against only 25 losses. In his 25 years of coaching track, Coach Hartmann had seen 17 of his athletes become State Champions in their own special events. The most celebrated runner of them all was Ulis Williams who in 2018 still held the World High School Interscholastic record of 46.1 in the 440 yard dash. Ulis Williams would eventually go on to win a Gold Medal in the 4×400 relays at the ’64 Olympics in Japan. Coach Hartmann had 37 of his athletes on the National High School Scholastic Honor Roll. Mr. Hartmann competed in track and field for four years while at the University of California at Berkeley upon graduating from Los Angeles Poly High School in 1919 where he won the CIF State Title in both the 12 lb and the 16 lb shot put.